Here comes one of the most entertaining parts of the weathering – chipping. With this model I wanted to try something new – chipping in both light and dark colors and using multiple paint types. First I have started with the light chips. I have used oil paints and mixed and light shade from Payne’s Grey and white. 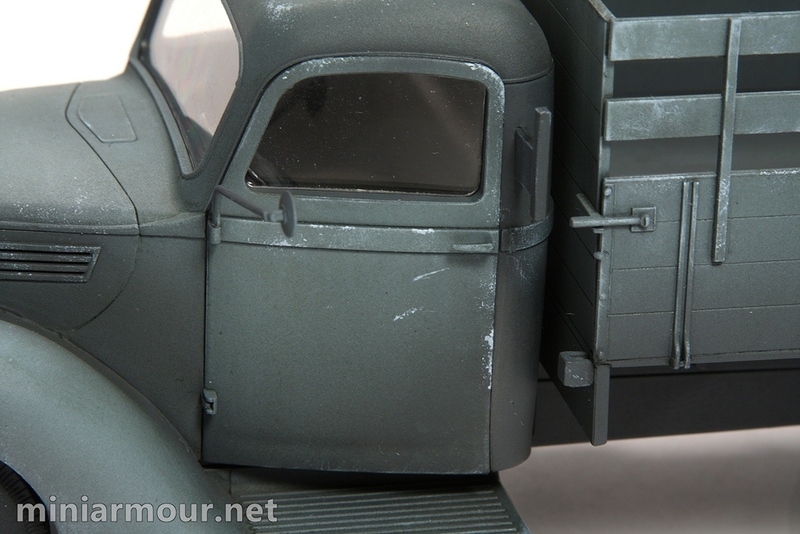 Payne’s Grey is quite interesting shade of grey, with strong blueish tone, so it fits the grey base color of the vehicle perfectly. The advantage of doing the chipping with the oil paints is that if you don’t like the effect, you have quite long time to fix it easily. The downside is that you have to wait ling time for the oils to dry – I usually give it at least 24 hours. I have applied chips using two methods – some of them were hand painted using very fine brush (18/0) and the larger ones were applied using a small piece of sponge. My idea was that for larger chips I would first put in the light spot and then in the next step I would paint it partially over with the dark chipping paint. I tried to avoid putting light chips at the lower part of the vehicle, where the underlying color is darker, as the contrast with the chips would be excessive and look unnatural. Using the sponge I created also a lot scruff marks on the top planks of the cargo bed walls, from both inner and outer sides. So on the cab I have focused on the usual areas where a damage would occur – outer edges of the overall shape, corners and edges of the doors along the swinging side, bumper, front edges of the engine hood, edges of the fenders, edges of the raised surface details, etc.